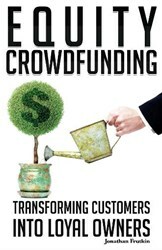 The Frutkin Law Firm, PLC announces the release of the audio book version of Equity Crowdfunding: Transforming Customers into Loyal Owners. The book, written by law firm Principal Jonathan Frutkin, provides insight into how business owners can turn their customers into loyal customers while raising money for their company. Because the SEC will soon adopt long-awaited crowdfunding rules, both Main Street businesses and start-up companies will be able to legally offer ownership in exchange for crowdfunded investments. Instead of being limited to sending mere gifts or product samples, the crowd will soon be able to receive financial dividends from their investment. The unabridged audio version of the book is available exclusively from Audible.com and from Amazon. The narration is done by John LoPrete, a professional voice actor with numerous credits to his name. The four plus hours of the book introduces the listener to the exciting world of crowdfunding, discusses both crowdfunding strategies and introduces the law, while focusing on the true power of equity crowdfunding – as an opportunity to leverage the marketing power of new owners. The book’s author, Jonathan Frutkin, is also CEO of Cricca Funding, a crowdfunding consultancy that works with profitable local companies to take advantage of this new marketing strategy. He has spent his career helping business leaders grow their companies by taking advantage of emerging opportunities. The Frutkin Law Firm, PLC was founded in 2007 by attorney Jonathan Frutkin with the goal of providing exceptional legal representation to clients throughout Arizona in business and corporate law and related areas, ranging from taxation and asset protection to estate planning. The Frutkin Law Firm helps businesses, individuals, and families in Phoenix and throughout Arizona with their corporate and business law, bankruptcy, taxation, asset protection, wills, trusts, and estates, and litigation needs. The firm has locations in downtown Phoenix and Scottsdale. For more information, visit http://www.frutkinlaw.com.